During Rajinikanth’s early days, the biggest challenge his mentor faced was the actor’s speed. If the scene required Raj­ini to walk across a hall, iconic director K. Balachander would rep­ea­tedly shout at him, “Medhuva, medhuva” (slowly!) so the camera could pan him leisurely. Yet the actor would have whizzed past, leaving the cameraman shake his head and throw up his hands calling for a retake. Rajini, even at age 68 today, moves on lightning feet. It was obvious from the way the superstar sprint-walked after a recent ‘meet and greet’ with the media two days after he announced his political entry. Maintaining that momentum in the political arena would be Rajini’s greatest challenge. His arrival has kindled the hopes of his fans, who had aged along with him waiting for their thalaivar (leader) to take the plunge. The Tamil public too are expecting his next move. So Rajini cannot plan a long gestation per­iod to launch his party. So what is the other Tamil superstar up to now? Kamalahaasan, after making all the promise to come up with his political party, has veered off to Los Angeles for the post-production work of his upcoming film,Vishwaroopam 2. The long gap and his absence response even on Twitter to various political developments in the state have reduced the 63-year-old to a non-­serious player. Even if he tries to retrieve the lost ground, Kamal may find his thunder stolen by Rajini. Rajini says his ‘spiritual politics’ is free of caste or religion. His critics aren’t convinced, and allege the star is only a front for the BJP. The thalaivar so far appears to be calibrating his moves cleverly. The day after his announcement, Rajini introduced his website and app for the public to enr­oll into his fans association. It is a leaf straight out of MGR’s book: such a club formed the bedrock of his party in its early days. “We have also been asked to reach out to every town and village to get the fans formally join the association and also register the unregistered associations,” explains Surya, an office-bearer of Rajini’s fans association. The fan-base is being bolstered by a spiritual outreach, something unheard of in Dravidian Tamil Nadu. On New Year Day, Rajini visited the Chennai’s Rama­krishna Math and took the blessings of the swamis. He shall soon be travelling upcountry to Rishikesh, to visit the ashram of his spiritual guru Babaji. Unlike the closet believers of other Dravidian parties, Rajini wears his spiritualism on his sleeve. At the same time, he clarifies that his politics will be free of caste or religion, expla­ining that “spiri­tual politics” is nothing but one based on ethics and fairness. Rajini also puts a high premium on his honesty and fair-mindedness. When distributors lost heavily after his films Baba (2002) and Lingaa (2014) flopped, the star did the unusual act of compensating them. In fact, his example was ­cited by distributors when they con­vinced Bollywood star Salman Khan to compensate for their losses over his 2017 Tubelight. After having inspired an ent­ire generation to smoke by flicking the cigarette on to his lips, he later urged the youth not to go for any such habit that did play havoc with their health. Rajini’s friends in the film industry caution that he will have to stay strong to keep his family from interfering with his politics. The bane of politics in Tamil Nadu has been the brazen influence of the leader’s family—be it the DMK or the AIADMK. Rajini had to pay a heavy price for the ambitions of his two daughters Aishwarya and Soundarya, as they atte­mpted to make a mark as film directors and flopped. Rajini underwrote their losses. His wife Latha was dragged to court by a financier over the rights of the film Kochadaiyan, and a building owner locked up her school over rent arrears. “In contrast to Rajini, his family members have a spotty financial record,” says his close friend in the film industry. 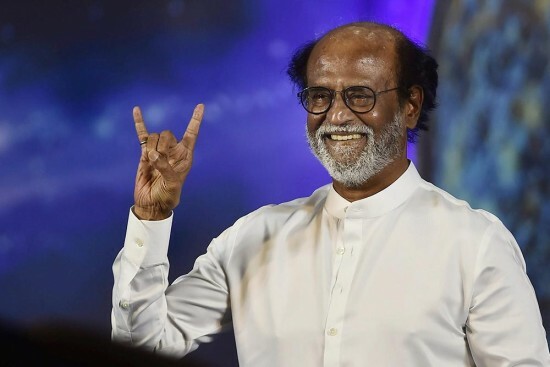 So when Rajini seeks to earn public trust by saying that he is not in politics for name, fame or money since they have alr­eady endowed him with these, he has a greater moral commitment than other politicians to give a clean government, free of family interference. True, he chose to bide his time and has sought to play it safe. The political vac­uum following the exit of late CM J. Jaya­lalitha and ageing DMK patriarch M. Karu­nanidhi has come in handy. Though Rajini has friends in every party from P. Chidambaram in the Congress to Prime Minister Modi in the BJP, his politics has to be his own. Rajini has to make his own mark without inviting the charge of being a proxy. He has to live up to what he had once told his political guru Cho Ramasw­amy: “If I come to politics, I shall be the striker on the carrom board and not the coin.” Time to prove that.